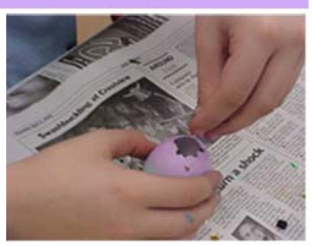 As we approach Easter, I’ll be sharing some fun Easter traditions and Easter Games, like this Egg Knocking Contest that I first heard of when I was a traditions consultant with Once Upon a Family. It’s such a fun addition to any Easter gathering. My husband would LOVE that! That is actually how he eats M&Ms. He puts two together between his fingers and pushes until one gets smooshed. That is the loser M&M that gets eaten. Totally crazy, but he has done it since he was a kid. I think he will LOVE this egg idea. I think we will start a new family tradition this year. We also have done this every year. We all now meet at Mom and Dad’s and we all do the contest between all of our extended family. What a fun tradition!!!! This is a Greek tradition! Last egg standing wins good luck. My family always does this. Another Greek Easter tradition is to dye all the eggs red, but we never did that because it’s more fun for kids to use all the different colors. Anyway, it’s interesting/cool to see that others are doing egg cracking, too. I had so much fun reading about this unique tradition idea – and I totally remembered it from my Once Upon a Family days!!! I have been doing an Easter Egg-stravaganza over at http://www.happyhomefairy.com filled with all kinds of Easter Traditions, Family Fun, recipes and free printables. I’d love for you to stop by! Thank you so much for this wonderful website and resource for moms everywhere. You are a blessing! We do the same thing in my family!!! !….have been doing it since I have been little. Now my 5 kids enjoy it! We have the same tradition, only instead of knocking we go on the floor and we slide them at each other. My mother makes a game chart and everything!! It is so much fun to see all the eggs decorated and it’s what we always look forward to! Our Daughter in Law’s Dad and his family came here from England when he was about 10 years old and they had that same custom when they were in England…it’s called Jarping! It is a fun tradition and each year, the winner of the Jarping contest receives a prize from the last year’s winner. Actually, it is a funny handmade trophy proudly presented by last year’s winner! If the same winner wins again, he or she chooses which person to give the trophy to. It’s all a fun time with lots of laughs! Happy Easter and good luck Jarping! I LOVE hearing that. How fun!! !